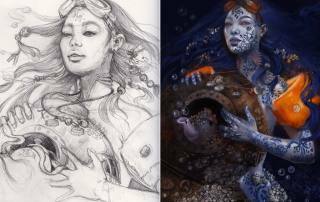 In this mermaid painting tutorial, I will show you the full process of my illustration The Porcelain Mermaid. I focus on digital painting and how I build up a whimsical illustration in many layers through an organic development process. There is a great deal of discovery in the process, combined with a basic structure. I work in Adobe Photoshop CC, on a Wacom Cintiq 27HD Touch tablet.